Judging by your comments on the last post, you’re about to be shocked. And then excited! See, one of the first things I did when we started talking about this trip was invite pretty much everyone I’m related to, and would you believe it, a lot of them declined. Their excuses ranged from the mundane – “we can’t afford it” – to the ridiculous – “we’re going on ninety-three years old and we have seven medical conditions between us and our sense of adventure and ability to galavant about the globe has been crushed under an enormous pile of all the extra travel equipment we need to take with us these days”. And by the jut of her chin and the glint in her eye I knew The Great Toddler/Nonagenarian Packing List Throwdown Of 2015 had begun. Oh! 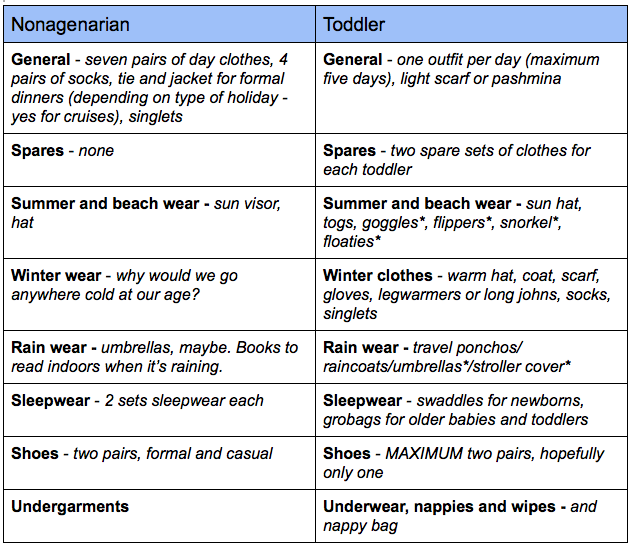 By the way, I’ve just updated my family packing list to include Grandma’s personal extras in case you want to skip past the drama and go for the practicalities BECAUSE YOU CAN’T TAKE THE EXCITEMENT. This is Great-Grandma’s first time using a smart phone. 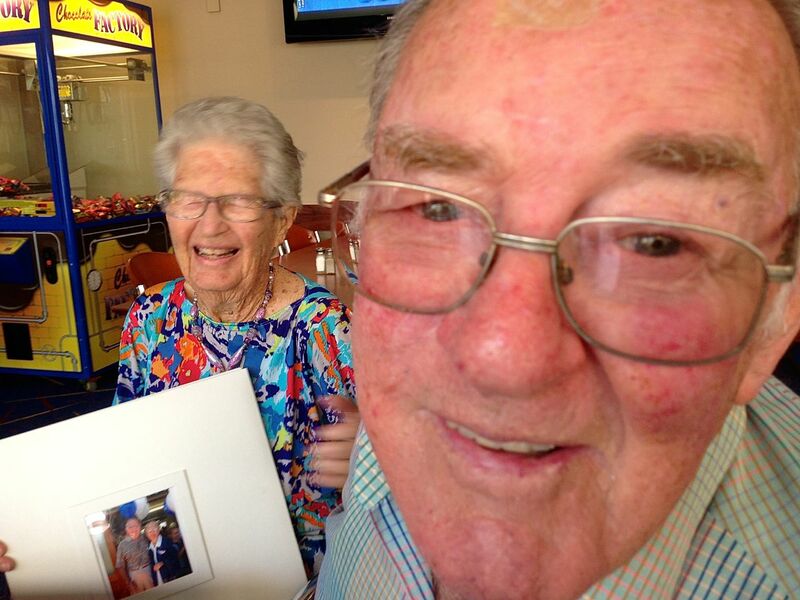 This is NOT Great-Granddad’s first time doing a photobomb. The local RSL Club, between the carvery and the pokies. Can’t quite bring myself to add this one up. Team toddler sort of lost, or is that “won”? I’ve forgotten what my original goals were but I think the “other” category shows that toddlers are whackier. Do you feel like a winner? Because it wasn’t really any of us. The list displayed here is my Grandma’s personal packing list, which she’s been using since she and my Grandfather turned 85. During that time, they’ve travelled to Papua New Guinea, New Zealand, Port Douglas in North Queensland, Thursday Island (on a cargo boat), and around Australia by cruise ship from Perth to Brisbane. She claims that, as of 2015, their travelling days are over, but so far nobody believes her. Grandma recommends separating each person’s luggage into their own, roll-along suitcase (and, if possible, getting someone else to pull it). 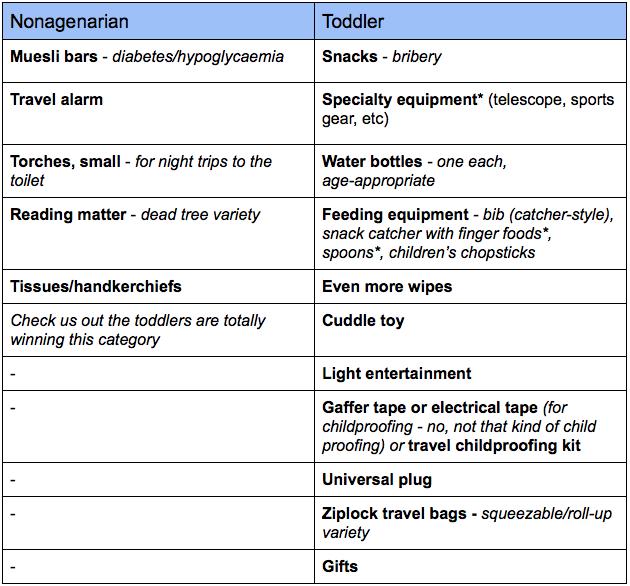 You can now view the new, improved, nonagenarian-approved version of our family packing list. And if you’re over, let’s just say “old enough to consider yourself part of a similar demographic”, feel free to add your own thoughts there. On a more-or-less related note, here’s what’s in our cabin baggage for travelling with kids. Being demented in a fun way would be good. I will aim for alive and fun. I have no doubt you’ll give it an awfully good try. Definitely remember this list when the time comes. I wonder what sort of new technologies you’ll have to add to it by that stage?? Your nonagenarians rock!! 🙂 Hope all is well with you Bronwyn. Yes, they do! Will have to aim to be as energetic at that age. And thanks! Long time out of the blogosphere. All is well – just busy with other projects. How are you? Would be great to get those longevity genes! I have my fingers crossed… But the bonus is not just living long but being able to stay active. Laughing Out Loud! Your Grandma is quite a firecracker, isn’t she?! Love this blog. I’d love to declare all involved are winners, the parents, the toddlers, the grandparents, and the readers! I’d also like to say that it gets easier, so look forward to the years when the children can be in charge of their own bags! You’re off again! Will have to pop over to your blog and catch up! Getting someone else to pull your luggage is the BEST tip ever. Your grandparents look so sweet and lovely. Great list and shall keep it for when I too am a photobombing Nonagenarian. Wow Bronwyn – in so many good ways. Your spreadsheet work is excellent. You could put each category for each group onto it’s own worksheet and then you could create a master for each group and then a comparative master for each category and then for the complete list. You can set it up so that each spreadsheet feeds off the group category n such a way that all you ave to do is change an item once and it canges automatically on alltha masters. hen,you are good. 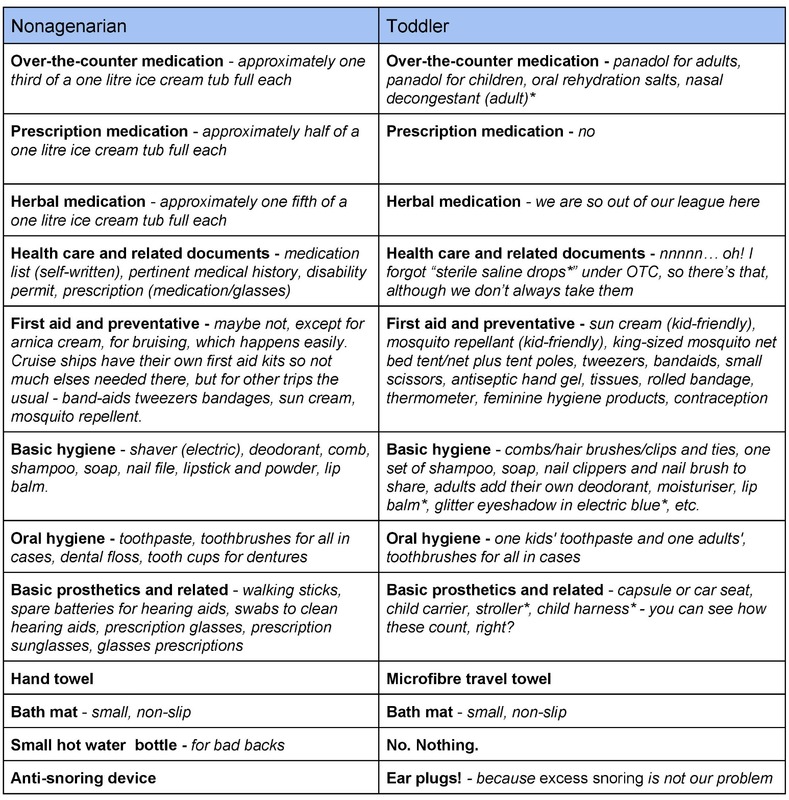 Having carefully read the offered material, I have two items to note: Under category 3: Medications and Health Care for the Nonagenarians, Presription for glasses appears under both “Health Care and Related Documents” and “Basic Prosthetics and Related” if you eliminated one of the two references, you could shorten the Nonagenarian list considerably. Bwahahahaha! 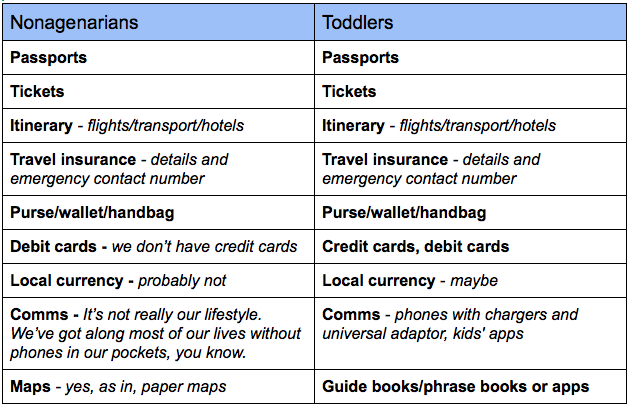 Also I am not sure that a telescope is necessary travelling gear for Toddlers. You may argue that it is common for your travelling gear, however, that said, I am willing to wager that if a large poll of parents travelling with toddlers were to be taken that you would find that most parents of toddlers actually travel successfully without a telescope. I am amazed at how much your grand parents have travelled at their age Bronwyn. Excellent. You have some long-life genes in your family tree. With modern medication and healthy living you could easily be active over 100 years. Whew, mind boggling, That makes you just a young’un Girl! 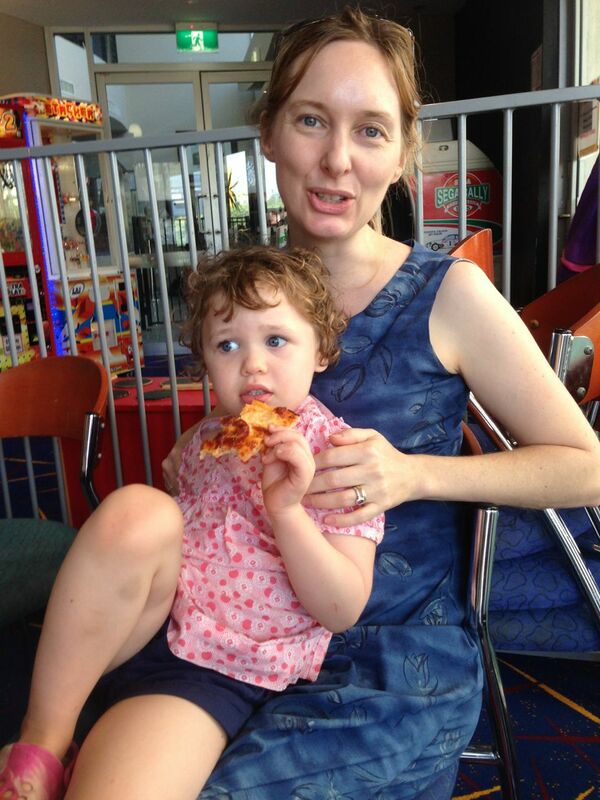 i am enjoying reading about your trip planning Bronwyn and that pic of you and one of your brood is awesome – you both look very cheerful and lively. Have you written any posts lately, by the way? I was just saying before the trip that it’s unusual for kids to get to know four of their Great-Grandparents (two on each side). They’re very lucky. Hopefully it’ll become more common as health care improves! Luckily we don’t travel with everything every time. Rarely take the snorkel with the snowsuit, for example 🙂 It’s still a lot. We’ve been noticing the drop-off since T turned three – it’s getting more manageable with each trip now. Next steps: night-time toilet training, then after that – carrying your own pack! I thought I was the spreadsheet king but you beat me hands down here. While most would find lists a bit over the top I fully believe in lists and plans and goals and all that nit picking stuff accountants are famous for. So we are soul mates in a sense. Enjoy your trip. Travelling with children brings back eye rolling memories for me. It’s not for the faint hearted. Looks like you have the stamina to deal with it. Bit worried about the fact that the great grandparents pack a change of clothes for each and every day but do not allow the same for the socks! We weren’t told how many changes of underwear were packed. Hope there’s a change for each day! I think the idea with the socks is that you don’t need them for your casual shoes (which will be slip on or sandals), only your formal ones, so maybe we can let them get away with that. That’s awesome! I agree no one “wins” here when it comes to the 573 pieces of luggage you need to bring, but everyone wins when they step out of thier comfort zone and explore! True and very well said! The luggage carrying is always a downside no matter what or how much. You just go as light as you can, I guess, while knowing that it’s usually worth it. Over 90 and still traveling… kudos! Makes me feel like I should take up jogging and eating vegetables (rather than blogging and eating chips). The others who’ve declined should be shamed. If the toddlers and nonagenarians are doing it then there is NO EXCUSE no to! I think we’d all like to be well enough to do all that in our nineties. A half tub of medications and a few aids here and there is good going really! Love this Bronwyn and love your grandparents. I don’t think the travel is done just yet. I especially liked the tub fulls in the medication section. Brilliant! Some of it must work, I guess… Not sure my Grandparents would be happy if I attributed all their health to modern medicine alone. Maybe diet and exercise and doing the cryptic crossword? Oh I agree there are many folks on lots of meds who are not active. A very different story! You’ve got to admit a fair bit of luck, too, I think, of course. Nobody wins when there are toddlers and ice cream cartons full of prescription meds involved.